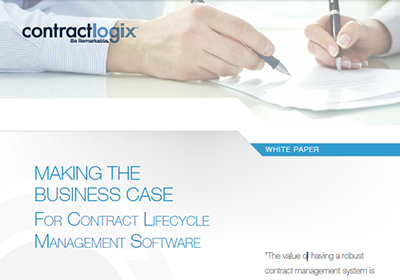 Making the Business Case for Contract Lifecycle Management Software. Contracts are a significant part of every business, so managing them efficiently is critical to the success of organizations in every industry. Using inefficient contract management methods, including paper-based contract systems or detached applications such as Word, Excel, Sharepoint, and Salesforce, can lead to missed deadlines, longer contract cycles, unforeseen costs, and wasted resources. The best way to minimize these risks is to adopt software specifically designed to optimize the contract management process from cradle to grave. But where do you start in making the case within your organization to make an investment like this? Complete the form at right to download your copy of Making the Business Case for Contract Lifecycle Management Software and learn the benefits of automated contract lifecycle management and how to sell the idea of its adoption within your organization.